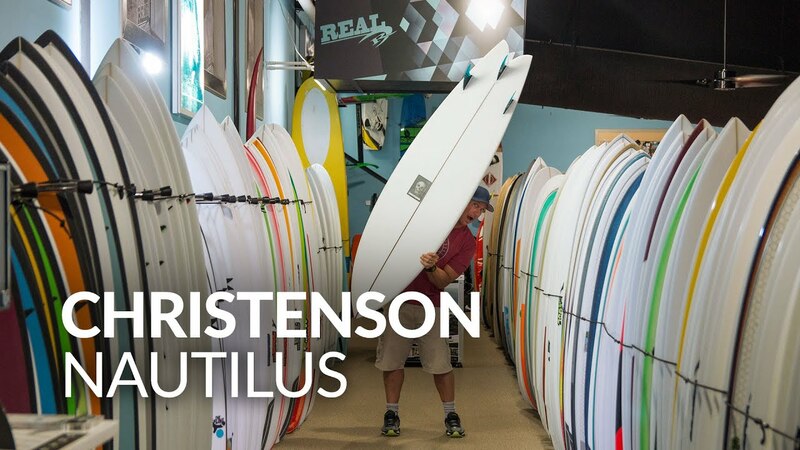 Surfing Surfboards Christenson Surfboards Christenson Nautilus Christenson Nautilus PU/Poly 7'0"
7'0" x 21.25" x 2.75"
The Christenson Nautilus is a longer, leaner spinoff of the classic fish, designed to feel at home in average to epic surf. 6'6" x 20.75" x 2.625"
6'8" x 21" x 2.625"
7'2" x 21.50" x 2.75"
7'4" x 21.50" x 2.75"
Available in sizes 6'6" - 7'6"
"The nautilus is designed to fill that missing link between midlengths and shorter performance and alternative designs." Most fish are super short and wide. The Nautilus takes the principals of the fish design and stretches them out to create a board with longer, leaner lines. The Nautilus can be ridden in tiny surf like a normal (short) fish, but really comes into its own in average and better days. Sizes most commonly ridden are 6'6 up to 7'6. •Available as a thruster or quad boxes or glass ons. We surfed the Christenson Nautilus in Cape Hatteras, in waves ranging from waist high to overhead conditions. 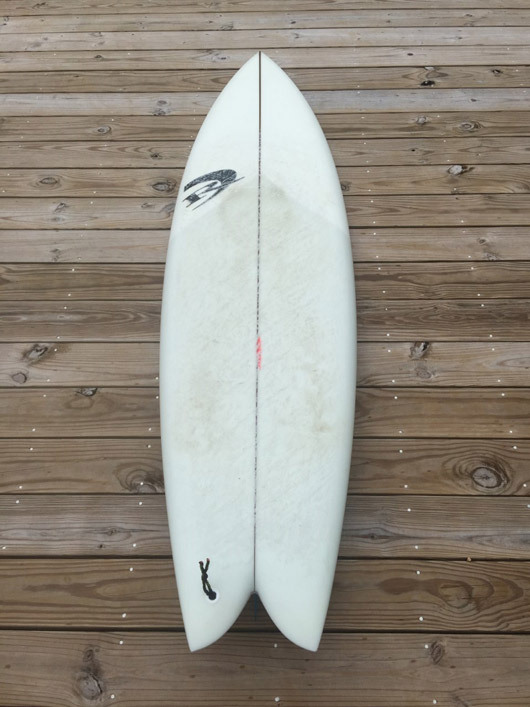 This board has generous volume, waterline length, and a conservative rocker, making it an incredible paddler and wave catcher. 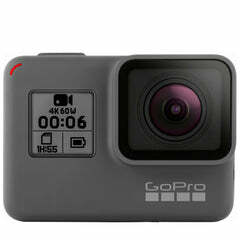 This makes the board perfect for challenging conditions like current or crowd filled lineups, or waves where early entry makes the difference between success or detonation. Once into the wave, the Nautilus swoops through drivey bottom turns and arcing cutbacks, generating impressive speed down the line. The thin rail profile sets an edge early, making it ooze of confidence in punchier surf. This same edge, combined with the length of the rail gives it tons of drives down the line. Racey walls and barrels? YES! The Nautilus loves to be challenged and excels in fast, down the line conditions. The tapered cedar stringer comes alive at higher speeds allowing you to load up and release the flex in the tail. This makes turning a larger, longer board ridiculously fun in waves that are typically more suited for shortboards and step ups. Christenson doesn't write the volume on his boards, and after one surf we realized how important this is. Whatever the volume is on our Nautilus, we probably would have been convinced into something smaller - closer to our shortboard volume. 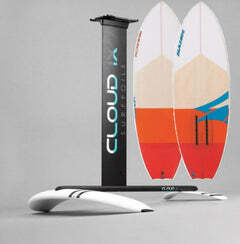 This board is so different than a shortboard, you want to size it completely differently. So by taking the volume number off of it, it allows you to open your mind to different sizing and sensations on the wave. 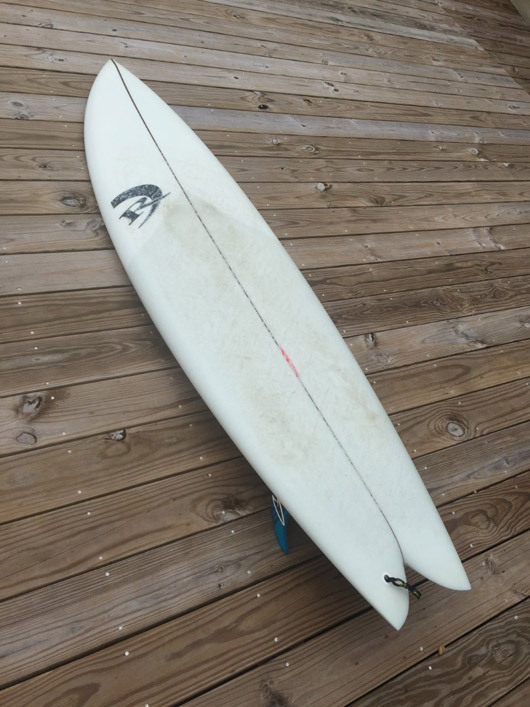 We guess the bottom line is that it felt perfectly sized for this type of board, caught a ton of waves (like longboard quantities) and was still small enough to duck dive. What else do you need? The Nautilus likes waves with some punch to light up. 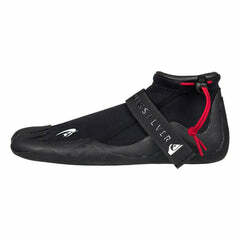 We surfed ours on waist high days with some curve to them and it was already feeling really good. As it got bigger, it just felt better and better. 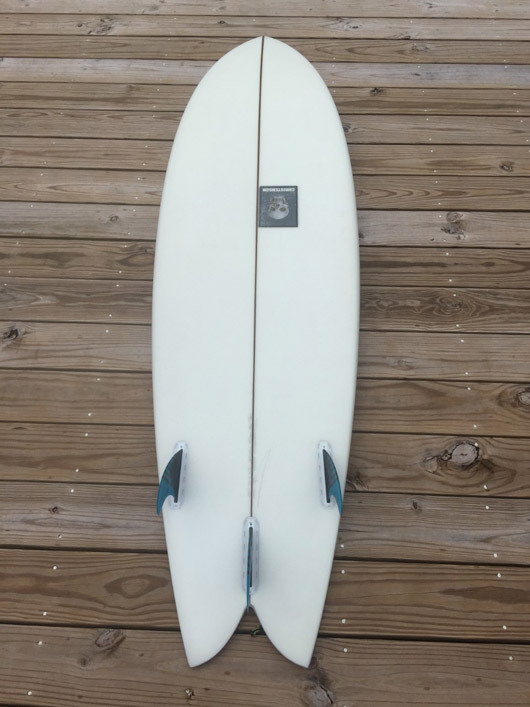 Stomach high and above this board is an absolute dream, making it the perfect go to, better wave choice for fish surfers, as well as longboarders looking for something more performance oriented when the waves turn on. The Nautilus is designed to be surfed longer. Most are in the 6'6 to 7'6 range. Pro surfer Sterling Spencer rides his at 6'6. That's a wake up call if you're thinking you want yours smaller than that. The board maintains 2.75" thickness for almost all of the lengths, so the larger ones don't get overly bulky. Having picked up and thoroughly "felt up" every board in our inventory, we can tell you that they feel shorter, smaller (and sexier) than their length would indicate. 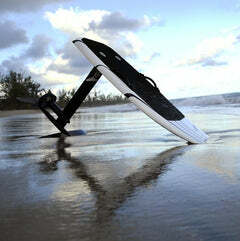 This means that most surfers could literally surf any size Nautilus and be stoking on it. Remember, the thickness stays constant, so longer just means more waves and more drive down the line, not more bulk. The Nautilus can be built as a Tri, or quad, both with boxes or with glass-ons. We opted for setting our stock boards up as thrusters with boxes for ease of travel, and also to add more pivotal performance to a board that already oozes of down the line speed. 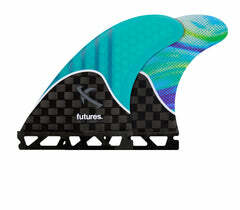 5-fin is not recommended on this board due to how many things are already going on in the bottom and tail shape. 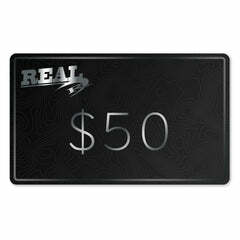 Custom orders for the above are always available thru REAL. 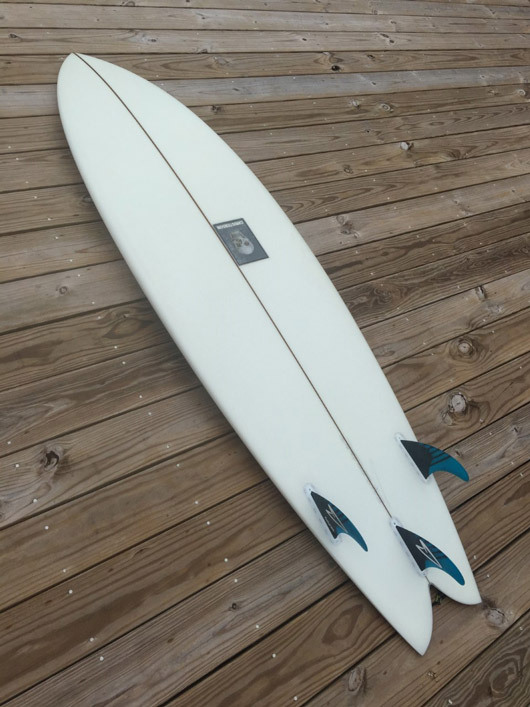 The look and feel of any of Chris Christenson's boards is next level and something that can't really be displayed fully thru digital pictures. Even the clear, sanded boards are all time. His tint, gloss and polish boards are out of this world and have to be seen in person to be fully appreciated. They cost more, but if you have the extra money, you'll never regret it. Most surfers will prefer the Christenson thruster or 5-fin set from Captain Fin to dial in the Nautilus set up with Future boxes. Since we didn't have access to these at the time of testing, and also since most of our surfers were larger, we used the Futures Roberts Generation Series Thrusters. 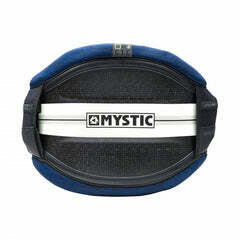 The Nautilus fits perfectly in a fuller volume quiver as your go to board for average and above waves. Fish aficionados will love it when the juice turns on. Longboarders will worship it as their "performance" board to throw turns and score barrels. Its familiar, confident feel makes an easy transition from any board and adds to the bigger wave days by improving your surfing ability and wave count.